LeBron James and Dwyane Wade lead the Eastern Conference in votes received after the second returns of 2007 NBA All-Star Balloting. 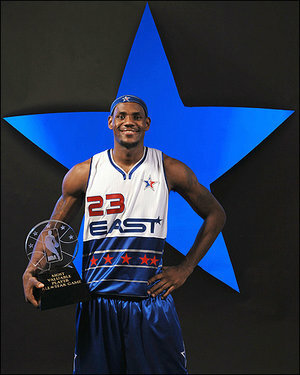 Lebron James leads all Eastern Conference players with 1,323,989 votes; followed by Wade with 983,321 votes. The Toronto Raptors’ Chris Bosh is second to James among Eastern Conference forwards with 497,283 votes. The New Jersey Nets’ Vince Carter (726,040) is second to Wade among Eastern Conference guards. Miami’s Shaquille O’Neal leads all Eastern Conference centers with 855,544 votes; followed by the Orlando Magic’s Dwight Howard (665,434).